I’ve never considered knitting and crocheting to be a defiant activity. I make things for fun, for stress relief, to relieve boredom, to express my love for the people in my life. I’ve recently begun to make things for charity. As the one year anniversary of the bombing approached, I found myself getting crabbier and crabbier. I was annoyed with some of the press coverage. I was annoyed that some people seemed not to care. As I’ve tried to absorb the enormity of the damage done to thousands of lives by two brothers* with an Internet connection, perhaps some mental illness, and a deep-seated hatred of their fellow man, I was losing faith in humanity. I was completely oblivious the day of the bombing. I hadn’t gone to the marathon. Had never been and was not interested in going. I was sitting in my car crocheting around the corner from the brothers’ home in Cambridge. I was planning to eat at one of my favorite cafes which happens to be in their neighborhood, but I wasn’t hungry yet. I overheard someone walking down the street yell something about “bombs at the marathon” to someone driving by but it made no sense and I couldn’t hear any emergency vehicles so I thought nothing of it. Then I got a text from an out-of-state friend asking me how I was. I thought she was inquiring about my health so I replied, but it as a little odd so I asked why she was asking. That’s when I found out. I still wasn’t worried. My friends aren’t really marathon-going types and I just assumed I wouldn’t know anyone who was affected. Everything was calm in that part of Cambridge so I assumed it wasn’t that serious. I preemptively called my mom to tell her I was fine and assumed my local cousins were fine and then I called a cousin in Hawaii to tell her I was fine. I left a voicemail but then wondered if maybe I should have checked on everyone. So I texted my cousins and my cousin’s mother-in-law. I got one reply that everyone in their family was fine. When my cousin’s mother-in-law texted me with just, “Call me,” I knew something was wrong. Come to find out I knew someone, Marc Fucarile, who’d lost a leg in the second bomb and whose life is now changed forever. It wasn’t just the one leg – they may still have to amputate his other leg and the list of other health problems due to burns, shrapnel, hearing loss, etc. seems endless. He’s endured more surgeries than I can count and yet the media still frequently refers to him as a “victim” of the marathon bombing. It’s accurate, sure, but what’s more accurate is that he’s a survivor. 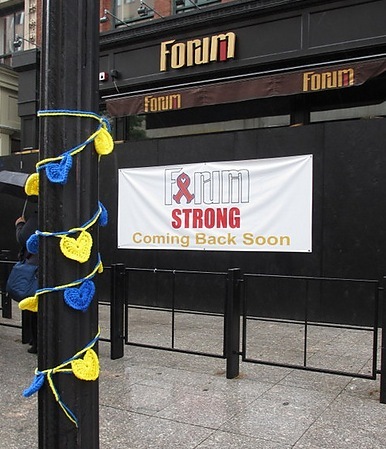 I keep seeing things in the media about how everyone who left Boylston Street alive is still alive today. But what does that really mean? It doesn’t address the PTSD, the endless healthcare appointments, the pissed off loved ones who can’t bear to see how much they’re suffering. All of them were in the wrong place at the wrong time but many of them are trying to build better lives in the aftermath. In so many interviews Marc talks about how amazed he is to see all the good that has come out of something so bad. Until the Marathon Scarf Project I hadn’t gotten to see it first hand in such a dramatic way. Scarves have poured in from all over the world – almost all 50 states and at least 10 countries last I heard. By the time we were done sorting the mail and the drop offs on Monday, the total count was 6,874. I have never seen so many scarves in my life. I doubt anyone else involved with the project has either. The scarves above are only about half of them. I’m sure we will reach 7,000 before it’s all done. One woman posted to Facebook that she’s delivering 45 more scarves today! 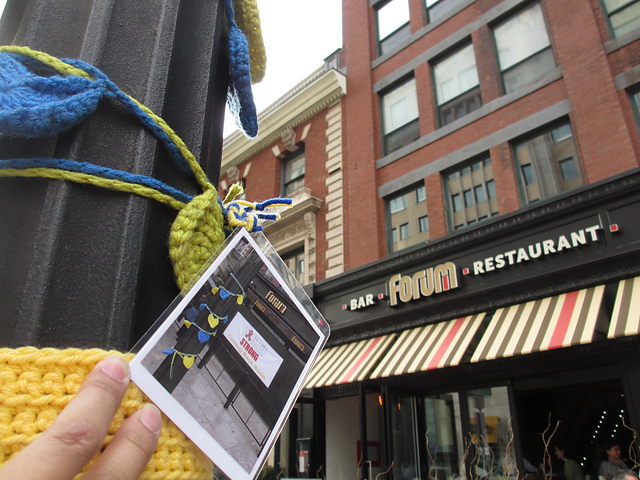 Last year I yarn bombed a lamppost outside Forum for #onerun. That’s where Marc and his friends were injured. Much to my surprise, I found my hearts were still there on April 5th at the bottom of the pole, looking much worse for the wear after a year of pollution and weather. I had been working on this year’s yarn bomb and debated what to do with them. 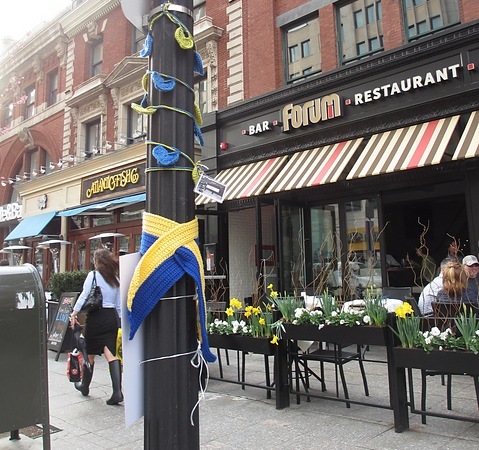 I thought about taking them down and washing them and putting them back up or donating them, but I decided to just move them back up the pole and hang the scarf with it. This time I made tags so people would know why they were there (special thanks to my friends Lisa & Will who provided laminating and color printing help!) and put them up yesterday. 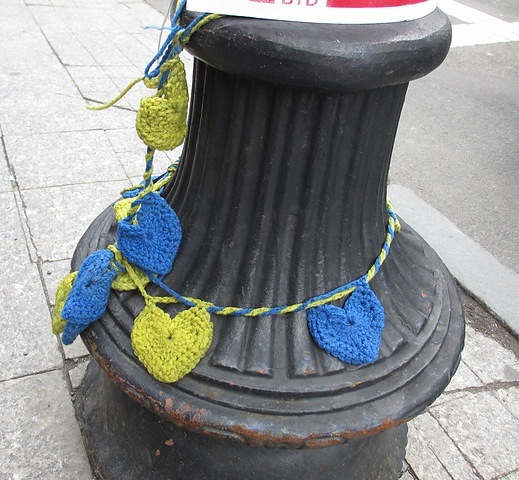 While working on the scarf for the lamppost, I came to realize that my Boylston Street yarn bombing activities are an act of defiance. Defiance against despair. Against hate. It’s so easy to feel hopeless in the face of such terrible violence. It’s hard to know what to do. I am always making things, so it seemed natural to make something. Update 4/16/14: I’m very excited to see that my hearts and scarf are getting press coverage! Kudos to the AP for properly identifying the hearts as crocheted. I had forgotten that philly.com actually wrote about the hearts last July (no photo). Someone has already added their own tribute to my scarf: Boston.com & International Business Times. The back: Mashable. Sadly, the note disappeared in the rain the other day.